I have 7 words for you…CROPPED MAN PANTS ARE A NO-NO! Yes, I made up the term ‘cropped man pants’. I believe the proper term would be an ankle pant but as you can see from my photo, on a 6’4″ professional male athelete, cropped man pants don’t look good….EVER! Not even on JJ Redick and that is saying a lot people! They may be Gucci cropped man pants but they are cropped man pants none the less. 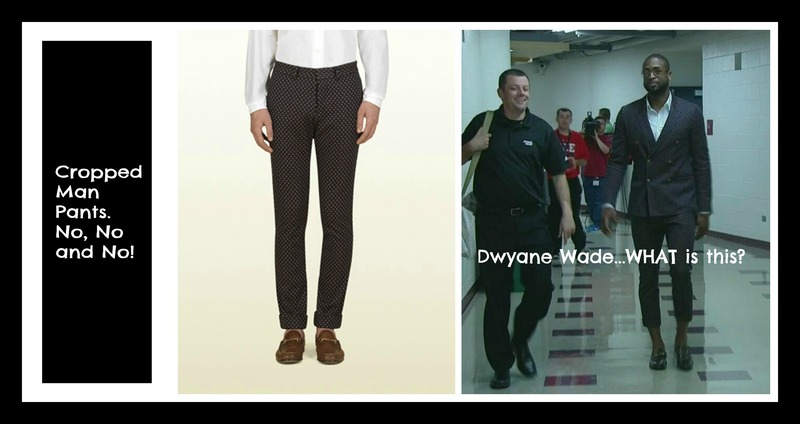 The thing that actually frightens me the most is that Mr. Wade probably actually had this Gucci suit custom made and chose to shorten the length of the pant. HE ACTUALLY CHOSE TO SHORTEN THE PANT! That kind of makes me want to throw up. Not really but I need to express my complete confusion over this pant choice. I expect Dwyane to make nothing but perfect style decisions from here on out. This is the playoffs and the playoffs are not a joke! Get it together. OK, I am done. I think these pants will haunt me forever or for the next 15 minutes until I forget I even wrote this post. I can barely remember what I did 5 minutes ago!